LR-Link, a maker of networking solutions from China, has introduced two new 10 GbE NICs based on an Intel controller. The cards are priced about 30% below similar products by Intel and other makers, yet they are aimed primarily at entry-level servers. 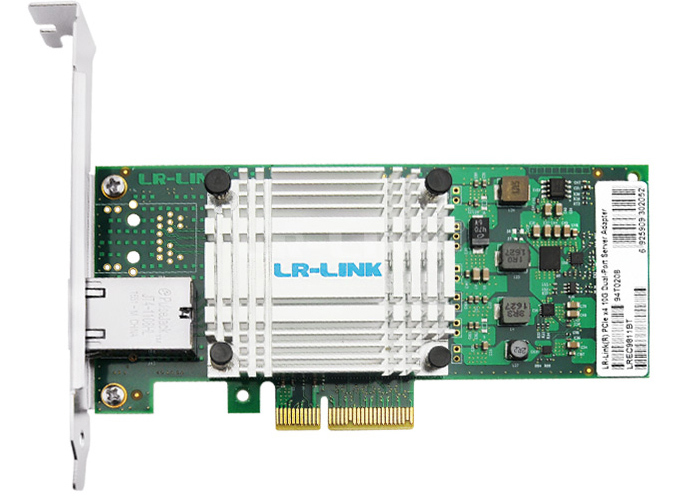 LR-Link’s single-port LREC9811BT and dual-port LREC9812BT network adapters are powered by Intel’s X550AT2 controller and feature a PCIe 3.0 x4 interface. The cards feature one or two RJ-45 connectors and support supports 100M, 1G, and 10G speeds using Cat5e/Cat6/Cat6A copper cabling. Intel does not explicitly deny that the X550 works with 2.5G or 5G routers/switchers, yet the company does not validate the controller with such equpment (at least officially), so nothing is guaranteed. Intel’s X550 controller ships with drivers for all server and desktop/workstation-grade operating systems from Microsoft, VMware as well as numerous Linux distributives. Meanwhile, just like Intel, LR-Link positions its LREC9811BT and LREC9812BT network cards mainly for servers. Aquantia’s single-chip 10 GbE solutions have made 10 GbE consumer-grade network adapters considerably cheaper, which lowered demand for entry-level 10 GbE server-grade NICs from SOHO customers. The later did not go unnoticed by traditional suppliers of 10 GbE cards, such as Intel. As it appears, the company has made its X550 chips available to third parties and we are about to see cheaper X550-based NICs from makers like LR-Link. It's worth noting that LR-Link does not sell its products at retail in the West. So the cards are primarily available from Alibaba, Ebay, and various other online retailers in China. At press time the single-port LREC9811BT can be purchased starting from $155, whereas the dual-port LREC9812BT costs $275. Doesn't look like it according to the spec sheet. NbaseT for 2.5 Gbit and 5 Gbit speeds was actually ratified after 10 Gbit Ethernet. The big difference outside of the raw data rate is that 10 Gbit uses a more robust error correction scheme where as 2.5 Gbit and 5 Gbit leverage the same that is used in 1 Gbit. "The big difference outside of the raw data rate is that 10 Gbit uses a more robust error correction scheme where as 2.5 Gbit and 5 Gbit leverage the same that is used in 1 Gbit." You are not entirely correct about the error correction scheme. Actually, scheme used by NbaseT is a bit more robust than used by 10GbE, although by a small margin. It is, however, much more straightforward. Nbase-T uses LDPC error correction coding for all bits of message, and sends final encoded data using PAM-16 modulation, 4 bits per symbol. 10GbE splits data to be sent into 7-bit bins, and only encodes 4 lesser bits with LDPC. LDPC data is concatenated with actual data, and is also split into 7-bit bins. These bins are then encoded using DSQ-128, which means that in a pair of PAM-16 symbols, only 128 combinations are used out of 256 possible, for the next sent bin the other 128-combination constellation is used. Thus, only the lesser bits, which are more susceptible to noise (as they correspond to lesser variations of signal level) are encoded. This scheme has probably been selected to reduce complexity of LDPC coder. 1GbE uses somewhat similar Trellis encoding. IIRC, 8 bits are encoded as 5 PAM-5 symbols, thus only 256 out of 625 symbol combinations are allowed. Upon receive, an disallowed combination is recovered to closest allowed one. CRC is used to check for remaining errors, there is no further error correction than Trellis code. Much higher power consumption of 10GbE is due to much longer digital filters used at much higher symbol rate. 10GbE has to use digital filters for echo cancellation(EC, subtracting signal transmitted at the given pair from signal received on it to permit full duplex operation), near-end crosstalk cancellation (NEXT, subtracts signals transmitted on other pairs from received on given pair), and far-end crosstalk cancellation (FEXT, subtracts signals received on other pairs from received on given pairs). For 1GbE only echo cancellation is mandatory, although I suppose better adapters do employ all the filters and are more robust to cable quality. For 10GbE, per each pair, EC filter has about 800 taps, NEXT filters have 3*300 taps (one set per each other pair), and FEXT have 3*100 taps, roughly. All these filters operate at 400Mhz. While 1GbE, having symbol rate 6.4 times lower, works with just 125 taps of EC per pair at 62.5 Mhz.